The winner for the Sep/Oct 2016 caption competition is Rob Falconer. The competition for Nov/Dec is now open. Go to the competition site and start thinking of the caption you think will best make Jenner laugh out loud. Who knows? You may win, and if you do, you will become the proud owner of the original artwork. The featured animal is a quoll, a marsupial carnivore about the size of a cat. Jenner was recently interviewed by Curtis Hoffman on the Basket Case site. You may read it HERE. Doc Rat: Just what the doctor ordered. Uncle Kage has been a regular attendee at the annual Australian furry convention ConFurgence (formerly MiDFur), held in Melbourne, Victoria. He gives so much to the fans that he has helped make the event sparkle with wicked yet intelligent fun. For ConFurgence 2017, in January 6th -8th 2017, I would dearly love to see him there again. But with the current cost of air fares, he needs a little help to make the dollar stretch that last little way. So, here’s where I want to pitch in. I will sell an art commission. The money will go entirely to topping up the Uncle Kage travel fund with the hope of bringing him to Australia in 2017. I will draw on paper, A4 size, a full-colour picture of your character in black ink pen and pencils. I will also scan it and provide a digitally coloured copy as well. The picture may be of your character alone, or standing side by side with Uncle Kage himself. I will complete the commission within one month of payment. UPDATE: THE AUCTION IS NOW OVER! THANK YOU TO THE BIDDERS AND CONGRATULATIONS TO THE SUCCESSFUL BUYER. Jenner will be at FurWAG, Perth, Western Australia. Sep 30th – Oct 12th, 2016. Yes, I will be attending FurWAG, the Australian furry convention of the west side of the country. Given that WA is the state where I grew up, graduated from medical school, learned art, made my cartoons and writings available to the international SF&F fannish community and jumped on board for the beginning of furry fandom, it’s only appropriate I return to Perth to join in the fun of these annual weekends. This will be my fourth, and I haven’t missed a single one. The guest this year is the fabulous artist Silverfox! Go to the web site for details. Here is the latest competition picture. Please send in your entries for your most side-splitting captions. I don’t yet have a winner for the July-August picture, but I should be able to announce that soon! We have a new Caption Competition winner: Dermot McAreavy! Priceless Jenner original artwork found. 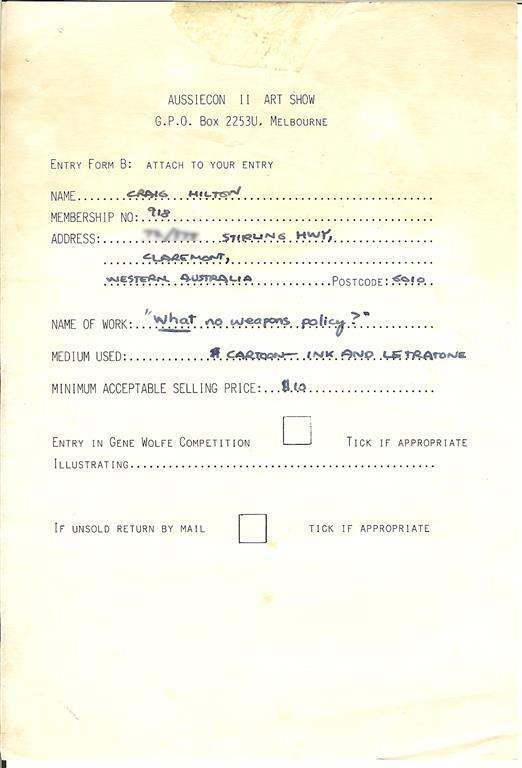 While moving house recently, a friend who had been involved in Aussiecon 2, the 1985 World Science Fiction Convention, found a single sheet of paper that he recognised as a piece of artwork I had created in 1984. It was one of the pieces I had submitted to the art show and hadn’t sold. So he returned it to me. 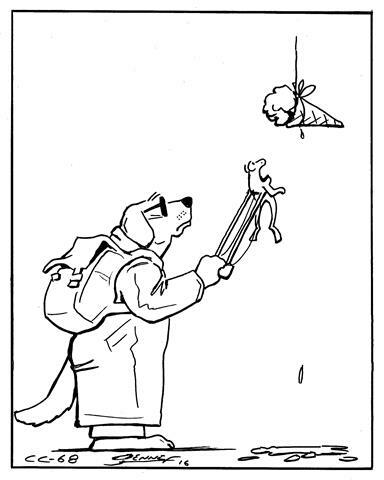 A lot of my fannish art back then had used anthropomorphic animals, so in a sense my cartoons were known through the world SF fanzine community for their anthropomorphic animal characters at precisely the same time that (unbeknownst to me) furry fandom was in the process of being conceived by American fans with parallel likes and tastes. 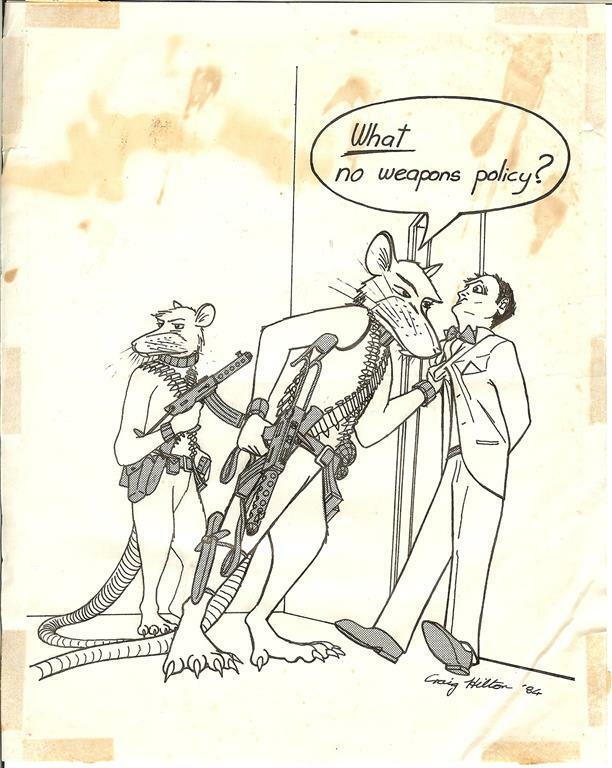 This was a cartoon that was published in one of the Australian ‘zines of the time, taking a humorous look at the debated topic of the “no weapons policy” for costumes. I used my favourite personal characters – sort of commando sewer rats – as the ones to debate the point with a staff member. That was in 1984. A year later, I hopefully took it and a few others with me to the big convention Aussiecon 2, aiming to sell them all for big money in some enthusiastic bidding wars. You’ll see from the attached bidding slip that the reserve price was $10. It didn’t sell. Ink and Letratone on A4 paper, some damage and staining. Of vast historic value. It’s now back in my collection, and it is no longer for sale. As far as I’m concerned, it’s worth much more. I hope the potential buyers who held back are kicking themselves today. The caption competition for May/Jun 2016 has been judged, and the next contest for Jul/Aug 2016 has been posted. Have fun! If you find you can’t submit your entry using the competition form, then until we rectify that, simply go to the Contact page. Don’t forget to identify your name and home city. Jarrad’s inadvertently revolutionary posters were based on one particular poster I saw a couple of months ago, in the university district of Carlton, here in Melbourne, I was intrigued by it. 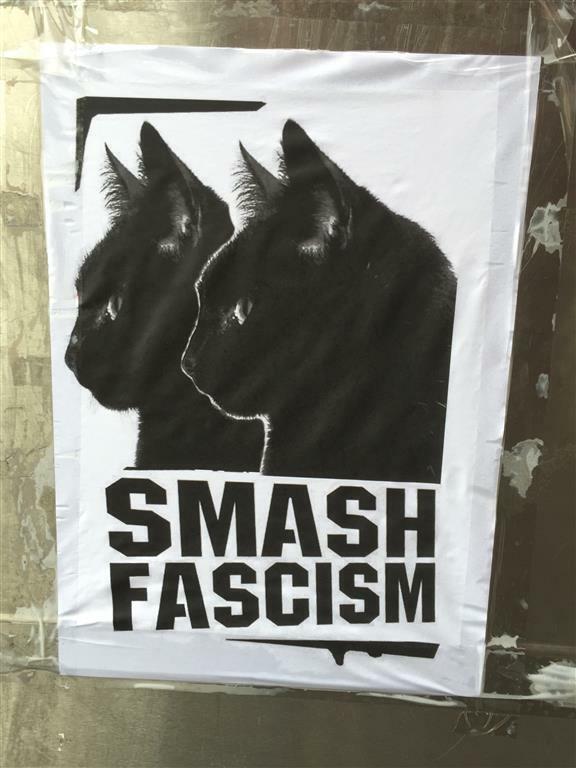 Although it implored me to Smash fascism, beyond that it was remarkably short on instructions. And I always find that pictures of adorable cats soften every message, so that made it doubly perplexing. I could imagine Jarrad wanting to spread joy and love, but messing it up in his own tangle-footed way. How far can this seven-year-old boy and his crew push the world to the brink of disaster in the name of peace? 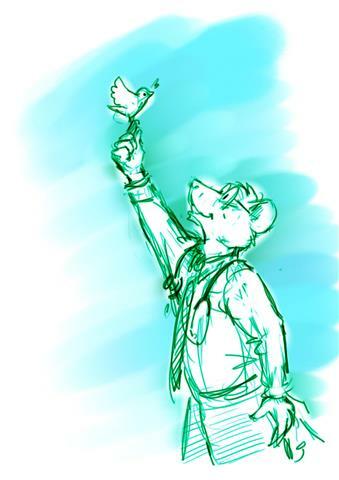 And here’s a sketch of Quarrydog, dressed up as a medical student. Yes, of course he’s only thirteen – I’ll have to be drawing Doc Rat for many more years before he reaches university age in the story. But we can dream, can’t we? Zootopia, in my opinion, is possibly the most nearly perfect animated move ever made. Simply put, in every single aspect it scores top marks. The look, the scope, the vista. The digital know-how to give an aspect as complex and intricate as if a real camera had filmed a real crowd in a real city. The animator’s craft so perfect and subtle and nuanced that if more fair to call it not character animation but animated characters acting. The flawless control of pacing. The beautiful, melodic, urban multicultural music score. And not least the writing . The script of Zootopia is a masterpiece, and its writers – Jared Bush, Phil Johnston et.al. – deserve to be immensely proud. I could talk for a long time about the significance of Zootopia as arguably the first ever big-budget movie in the modern anthropomorphic style: animal characters who take ‘human’ roles but whose animality is an integral part of the premise. And there may come a time when I do. I would enthuse at length about the shrewd sequence of logical cause and effect that propels the story, the many witty devices, the deftly-crafted humour and the richness of what I call “the emotional symphony”. But for brevity, I’ll stick to one single aspect: Apology. Because of all the qualities of the writing that stand out, the place of apology in the storytelling of Zootopia bears a maturity rare in this category of family-targeted movies. Yes, the vibe’s about holding on tight to your dream. But what is neatly slotted into the screenplay’s background is a precious lesson in life – how to make good on your mistakes. How broken things – and broken people – can be fixed. 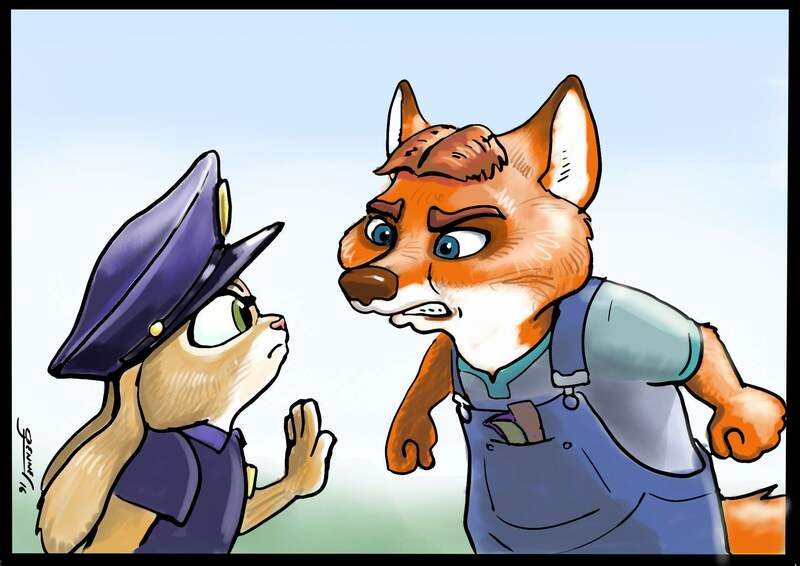 To me, what nailed it were the two episodes with Gideon Grey, the boy fox who was (rabbit) Judy Hopps’ childhood bully. He terrorized her, beat her and walked away unpunished. Fast forward many years. Hopps stays true to her dream and enlists in the police academy, becomes the star graduate officer and sets out as a trailblazer for rabbitkind as Zootopia’s first bunny cop. She expects to treat others fairly and to be treated fairly, regardless of species. But while she has her successes, she also has a major public screw-up, brings what she sees as disgrace to her uniform and shatters her own dreams of making the world a better place. She tried, she failed, people got hurt, and she withdrew to the ambitionless safety of her small-town family home base. Enter the grown-up Gideon Grey. Bigger and hungrier than ever. Shock and panic, then relief. The brain-dead bully really has grown up, not just physically but also emotionally and, dare I say, spiritually. No, he did not need to be beaten up to teach him a lesson. There was no place for retribution, score-settling nor any other comic book ‘justice’. This simple soul had found his own peace. Most importantly, he (alone or with counselling) had come to his own insight, had recognised his fault and attended to it. In so doing, he had found peace, and thereafter his every step upon the earth propagated this peace to others. This is an astonishingly rare piece of storytelling, and on experiencing it my heart lifted and sang. The ‘villain’ took it upon himself to find his own insight, the insight that could never be forced into him with a fist. Guided by his insight, he explained to Judy Hopps his past screwed-up-ness, frankly apologized and… well, that was that. It was sincere. Hopps was disarmed by the apology, and so was I, because quite plainly in the recent years Grey had been more than corrected. He had been healed. What makes Zootopia a masterpiece of writing is what happens next. Grey unwittingly points Hopps to a clue that can help her get back on the trail of her major case, so off she races to the city. But subtly, what Grey has given her as well, in his own salt-of-the-earth manner, is the object lesson that you can make good on your mistakes. He is spiritual healing personified. Even when the mistakes are ones for which other people have paid your price. And it’s then you start to realize that Hopps is a flawed character, just as was Grey. As a child at the movie’s outset, her uncalled-for public taunt of the bully at the school concert was an act of hurt that was no less excusable than his standover attack on her. And her Zootopia Police Department press conference blunder could be laid on the doorstep of her ingrained, bucolic prejudice. Just under her surface, under her gently smiling tolerance courses racism in the antithesis of the values she claims to hold so high. Not that she ever would have recognized it as such, even when told. Grey was paradoxically ahead of Hops in the wisdom stakes. He taught her that insight heals, and with this reflection, she healed herself, her severed friendship with Nick Wilde, the damage to her mishandled case and the people of the city. And then, in the natural course of these things, adventurous crime fighting ensues, and justice is ultimately delivered. Wrapping up, Hopps’ finishing speech to the next generation of police college graduates evidences her new moral maturity as it recaps the above and delivers her lesson on sound, workable values in a complex world. Oh, I do so sincerely hope that storytelling and scriptwriting of this calibre will be the future benchmark for all such motion pictures. What I strive for, at least in the more serious periods of the Doc Rat stories, is a lesson in fixing wrongs, in making amends, and in healing. I try to manifest the notion that true reconciliation heals both parties, and likewise the healing of both parties is a precondition to reconciliation. 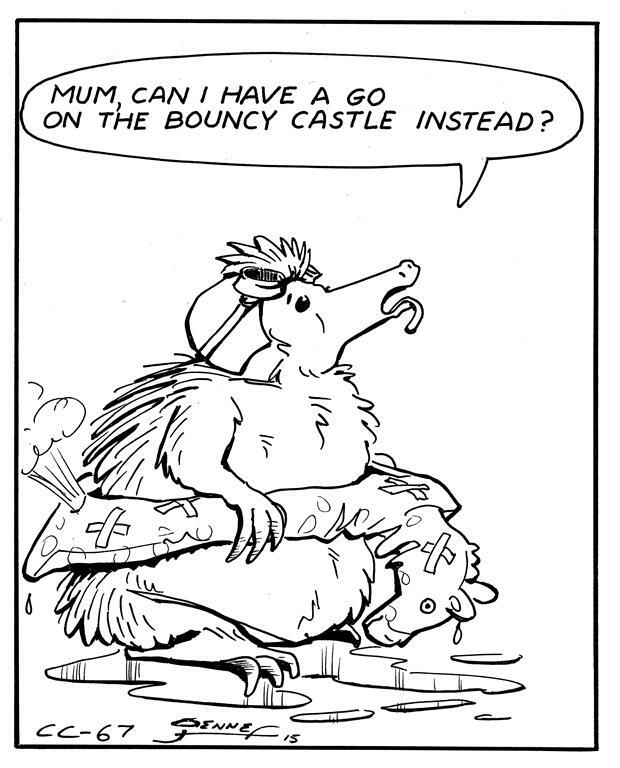 In the ‘Jennerverse’ world of Doc Rat, I have often set apologies formally in the rabbit ceremony of charonta-lamba. But the full formal ritual is not always needed. The skill can be applied at any time of making things right again. Rabbits do it on the hop, so to speak. The knowledge of the principles is the important thing – what it means and what it takes. Apologies have the power to create peace. I couldn’t have put it any better than the way in which it was dramatized in the story of Zootopia. I take my hat off to Messrs Bush, Johnston and the story writing team. Well done indeed. Ten years! Yes, it really has been ten years! Doc Rat first appeared on Monday, June 26th 2006. 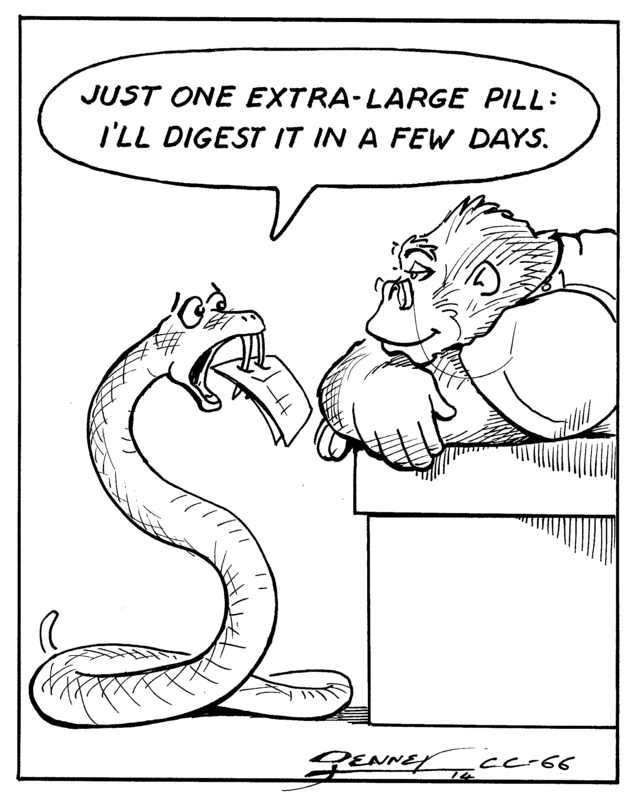 I am proud to have continued to bring a strip to my readers five times a week since then. Almost without a break. There are some occasions in that span when for technical, personal or other reasons there has been a break of some weeks, but apart from those minor gaps I have worked strenuously to keep the show on the road. We are now well past the two-and-a half thousand mark. For the first 500, I drew them on paper. These works, in centimetres, were of the dimensions 24 x 7 – a wry joke I set for myself to remind me of the amount of my life this project threatened to claim (or at least once I added my Doc Rat duties to my main duties as a full-time doctor). The subsequent strips have been created on a Wacom tablet, running Corel Painter. My goal with going electronic was to preserve the hand-drawn feeling, so that a reader would be hard-put to tell whether what they were seeing had been crafted with ink on paper or digital ink on a screen. Certainly, though, going electronic allowed me a lot more flexibility to correct and clean up my lines, resize heads, redraw without erasing the life out of paper, and of course type in the text instead of having to letter by hand. I originally thought I would be able to create strips faster on the tablet. As it turned out, I am doing them better, but sadly not any faster than before. Time and practice has made Doc Rat much better, actually. Even though the first strips still hold up well enough, they are necessarily early works of a person with ten years less experience. Which brings me to the archive. Since the web site’s program was reincarnated in WordPress a few years ago, it has been a long-term goal of mine to restock the ten years of archives. The admirable Wolf Bylsma has done a lot of this, but there is still more to be done. I’m working on it. The fannish discussion site, The Cross Time Cafe, took Doc Rat on board as one of its works for ongoing conversation. I recommend you give it a look. The form of Doc Rat grew as the characters developed more complete lives of their own. Small story arcs became larger story arcs, and there were stretches of serious drama in amongst the usual minefield of funny jokes. That’s just how it turned out. Life is laughter and tears. My goal has been that if I am to tell a joke, I tell best joke I can. If a story, the best story I can. Ben has gone from a single man to engaged, married and a father. Daniella and he have faced peril and death, as have many of their friends. Societal change has been on the agenda, as it is still. It’s a case of healing the small things and the big things. Jenner can now be followed on Twitter. All of the current daily strips, some of the past ones and the occasional whimsical musing. Follow Jenner with @DocRatComic. March-April 2015 caption competition is now open for entries! Go to the “competitions” tab. Is Ben Rat an M.D.? Well, no. You see, that’s American. In Australia, the initial graduate qualification is M.B.,B.S. – “Bachelor of Medicine and Bachelor of Surgery”. Of course, that’s still basically the same thing. Ben has the M.B.,B.S., and then some extra letters to represent further post-graduate qualifications. Medical doctors and teachers both have a very human job. To perform well in their craft, doctors must elicit information, compile it into some sensible order and then, with a base of knowledge, come up with a correct answer, after which they finally – and this is where the teaching skills come in – impart that answer in a way that gives the patient the understanding and skills to take the problem to its resolution. The best treatment doesn’t treat, it empowers the receiving person to self-treat. It renders the patient more capable and less prone to needing care. The best consultation is when the patient walks out the door happier, smarter and stronger than when she walked in. So, do doctors like teaching? Ha! Just try to stop them! Ben educates and empowers his patients in the course of his consultations. He has also taught formally, in a voluntary capacity in some community education functions. Daniella is a doctor of dentistry and works with patients. As you know, she also teaches dentistry to students as a lecturer at the Bluegum University. And she teaches Tae Kwon Do at the community centre. Both Doc Rat and Doc Wolf started teaching Quarrydog the basics of doctoring. Mary started teaching Ben and Danni Secret Bunny Business. All are passing on knowledge, an interpersonal service practised with skill. 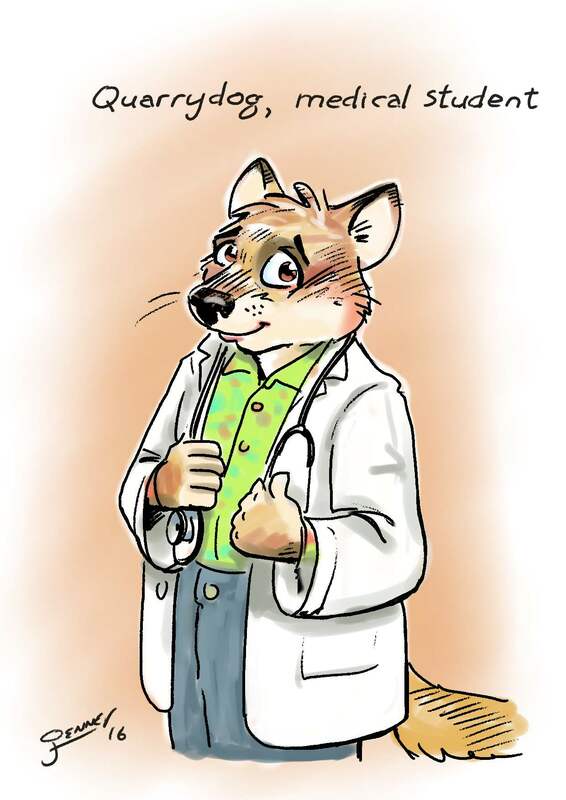 The reason I introduced Simon/Quarrydog as a young character who wanted to become a doctor was, in part, prompted by the fact I also teach medical students from Monash University. I do this in a one-on-one situation in my rooms, as I work through my daily consultations. And yes, teaching is satisfying. Successfully transferring skills to someone, to enrich that person’s capacity, is an intensely rewarding thing to do. Here’s to the world’s teachers. May they ever be recognised. Sit back and enjoy the continuing adventure of Quarrydog, as he deals with his role of bringing peace to a divided society. Doc Rat and Nurse Mary have to stitch together the torn fabric of… Look, this comic is part social activism and part funny jokes, okay? For the next two weeks, there will be a break in the story line, while I build up a bit of a stock of strips to carry me through the coming month. I have a commitment to attend a doctors’ convention here in Melbourne and then FurWAG in Perth. With those two requirements, if I try to keep up with the current story strips, I am going to fall short. 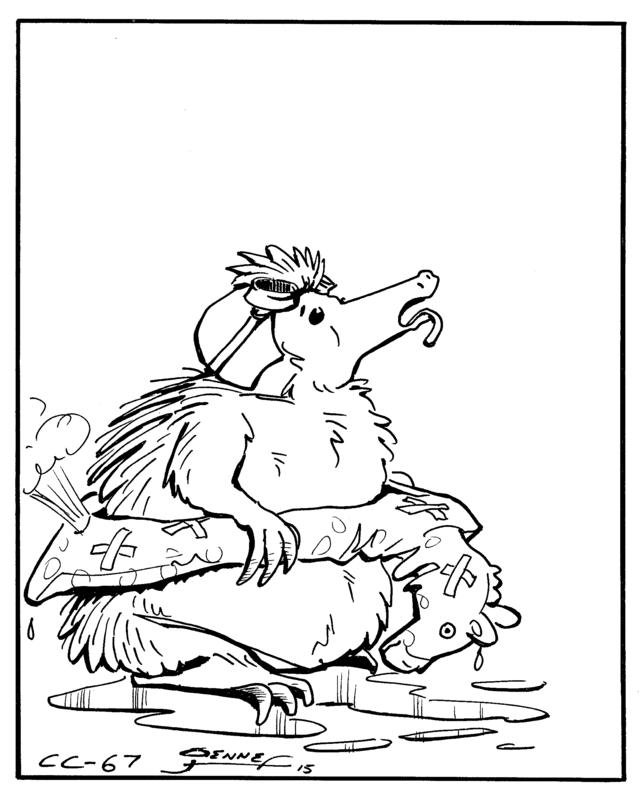 So, I will have to put Doc Rat on hiatus. Sorry. But to keep the site interesting for you, I will be showing you every day some examples of my rough drafts and commenting on how they relate to my creative process. For those of you who are on the edges of your seats wondering what’s going to happen to Quarrydog, I can only give you my apologies and ask you to hold on as the timer ticks down. 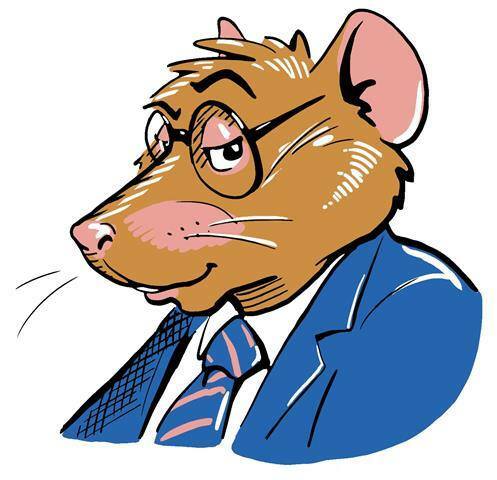 To all my devoted readers, I bid you welcome to the brand new Doc Rat web site. I know the wait has been excruciating, but you will certainly find this new production has been worth the anticipation. Why the change? 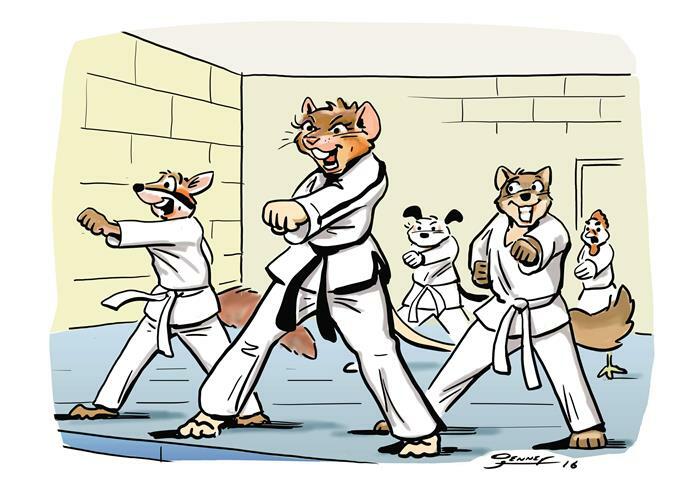 Well, the program for the original Doc Rat site had been outpaced by the advances in today’s operating systems, as a result of which they no longer let it perform to its best standard. That’s why people like you were having problems with it. Naturally, this was not good enough, so it was time for a change. A big change. I thank my webmaster Wolf Bylsma for his sterling work in creating our new home, often against difficult odds. And the wonderful Level Head for bridging the gap in the interim with his mirror site, archive and postings on the Cross Time Café discussion forum. So what will you find in the new Doc Rat site? Well, it’s like Ben and Daniella’s nursery – good enough to start off with, with a touch of work to go. We haven’t finished stocking the archives yet, but that will come with time. Things will keep getting better.